Custom promotional products, like reusable bags, are an effective way to get the word out about your brand. 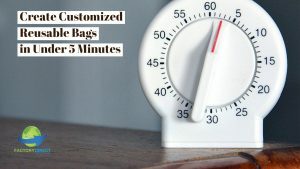 While you understand the marketing value of customized reusable bags, you may think you simply don’t have enough time to create something unique to represent your brand. Our daughter brand, Factory Direct Promos, recently explained how quick and simple it really is to design your customized reusable bags. Customized reusable bags make great promotional products because they are very visible. These bags make great shopping totes, gym or beach bags, work totes and more. When your customers carry your branded bag they will not only reinforce your branding message with themselves, but they will also spread your branding message to others. One bag can easily last for about six years, but maybe longer, making it a great investment for your brand. The notion of designing your own custom reusable bag may seem overwhelming. You need to make a lot of choices and everything needs to come together to look and function just the way you want it, to represent your brand. While this may seem like a lot, it really isn’t that intense. Factory Direct Promos have streamlined the process to make it quick and easy. You need to make a few choices to start the process and that’s it! The first thing to decide is the material and size. Factory Direct Promos has lots of great info explaining the different material options to help you select the right fabric for your job. There are also a variety of predetermined sizes, so you just need to pick the size you want. If you want your bag to be a size that’s not listed, that’s fine. You can create a custom size to best serve your customers and your brand. Next up you need to select the color of your bags. Lastly, pick out add-ons, like pockets, closures and more. These additional features help make your custom reusable bags more functional and useful to your customers. An emphasis on environmental issues is causing an increased demand for eco-friendly products. Utilizing customized reusable bags to market your brand is a smart way to increase the awareness and recognition of your brand in an environmentally responsible manner your customers will appreciate, and may even expect. When you work with our daughter brand, Factory Direct Promos, to create your custom reusable products, the entire process is quick and easy. Learn more and read the post from FDP!